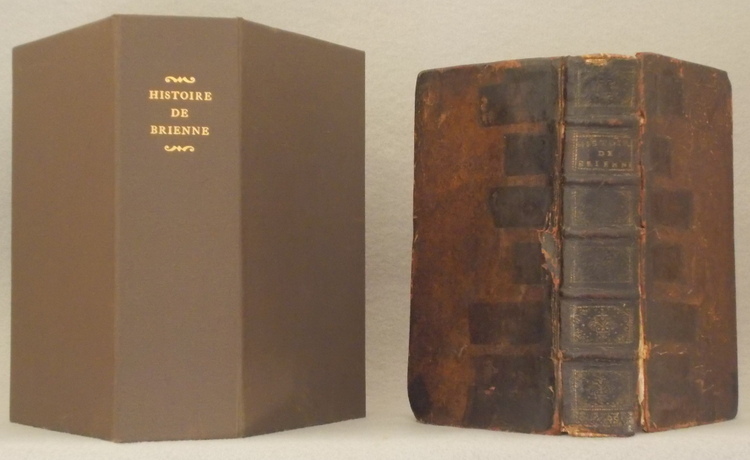 Histoire de Jean de Brienne, Roy de Jerusalem et Empereur de Constantinople. Octavo 6 ½ X 4 ¼ inches. A-X 12, Y1, Z-Bb6. First Edition. There is some tanning to the edges of the first and last few leaves, occasional mild foxing; the joints are cracked with the covers attached by the cords. Some cracking to the leather and wear on the corners. After reading this, it is hard to believe that so much could be packed in one life, but alas this is why there are such books . John of Brienne, King of Jerusalem and eventually emperor of Constantinople, 1148-1227. In 1208 envoys came from the Holy Land to ask Philip Augustus, King of France, to select one of his barons as husband to the heiress and ruler of the Kingdom of Jerusalem. Philip selected John of Brienne [1148-1237], second son of the Count of Brienne. In 1211 John concluded a five years’ truce with Malik-el-Adil and during the Fifth Crusade urged Pelagius of Albano to accept favorable terms from the Sultan Al-Kamil. Pelagius refusal led to disaster for the Christians. The Crusaders left for Acre in 1217 and joined John of Brienne, ruler of the Kingdom of Jerusalem, and Prince Bohemund IV of the Kingdom of Antioch to fight against the Ayyubids state of Egypt. In June,1218, the crusaders attacked Damietta, an important Egyptian settlement. The Sultan Al-Adil was unprepared, but the city resisted the crusaders. It took the crusaders several months and thousands of lives to enter Damietta, but once they did they looted it for several days finding enough loot to inspire them to attack Cairo next, their only obstacle to a powerless Egypt and an open road to Jerusalem. After the failure of the crusade, King John came to the West to obtain help for his kingdom. In 1223 he met Pope Honorius III and the emperor Frederick II at Ferentino, where, in order that he might be connected more closely with the Holy Land, Frederick was betrothed to John’s daughter Isabella, now heiress of the kingdom. After the meeting at Ferentino, John went to France and England, finding little consolation; and thence he travelled to Santiago de Compostela, where King Alfonso IX of Leon offered him the hand of one of his daughters and the promise of his kingdom. John passed over Alfonso’s eldest daughter and heiress in favor of a younger daughter, Berenguela of Leon. After a visit to Germany he returned to Rome (1225). Here he received a demand from Frederick II (who had now married Isabella) that he should abandon his title and dignity of king, which, so Frederick claimed, had passed to himself along with the heiress of the kingdom. John avenged himself on Frederick, by commanding the papal troops which attacked southern Italy during the emperor’s absence on the Sixth Crusade (1228–1229). In 1229, John was invited by the barons of the Latin Empire of Constantinople to become emperor-regent, on condition that Baldwin of Courtenay should marry his second daughter and succeed him. He then ruled in Constantinople, and in 1235, with a few troops, he repelled a siege of the city by John III Doukas Vatatzes, emperor of Nicaea, and Ivan Asen II of Bulgaria, leading a successful cavalry charge which killed some 10,000 enemy soldiers. LaFitau [1670-1740], Jesuit who also authored a two volume work on the customs of savages in earliest times and another work on Couvade, a custom in some primitive cultures in which husbands mimic the behavior of their wives in pregnancy. He also served as a Missionary to Canada. Often referred to as a father of comparative and scientific Anthropology, his work on the Iroquois “Moeurs des Sauvages Amériquains” is quite important.